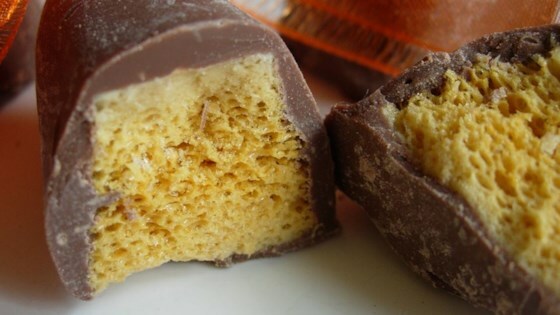 "Sugar and dark corn syrup are cooked with vinegar and tempered with baking soda to make a crunchy candy that gets covered in a chocolate coating." In a medium saucepan over medium heat, combine sugar, corn syrup and vinegar. Cook, stirring, until sugar dissolves. Heat, without stirring, to 300 to 310 degrees F (149 to 154 degrees C), or until a small amount of syrup dropped into cold water forms hard, brittle threads. Remove from heat and stir in baking soda. Pour into prepared pan; do not spread. (Mixture will not fill pan.) Allow to cool completely. In the microwave or over a double boiler, melt coating chocolate, stirring frequently until smooth. Break cooled candy into bite-sized pieces and dip into melted candy coating. Let set on waxed paper. Store tightly covered. See the heart-warming story of an enduring Depression-era gift. Wonderful recipe, brought me back to my favorite childhood treat. BUT much better with real dipping chocolate than the coating. The only issue I had with this recipe wasn't really with the recipe. You should note, REMOVE IMMEDIATELY from heat when the desired temp is reached...otherwise, it tastes a little burned.